A creative team over at Saatchi Saatchi Germany has come up with a cool way to feature a new line of Pampers diapers called Cruisers. The diapers apparently offer greater flexibility around the legs and therefore greater mobility for little tots. So they’re “play” diapers, whatever that means. Personally, I can’t imagine a parent switching diapers just for playtime–and I’m qualified to have this opinion since I have a child currently in diapers–but hey, maybe some parents are looking for a diaper just for play time. 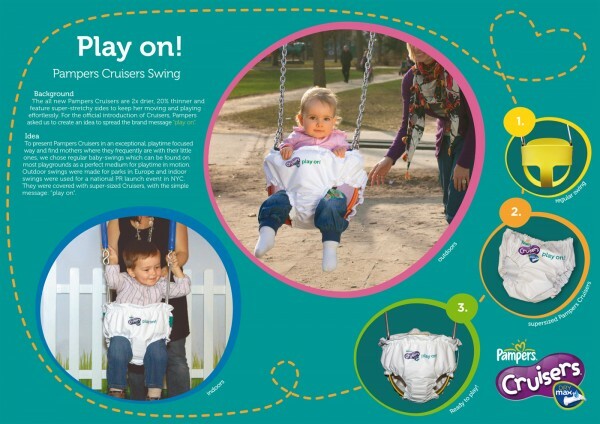 In any event, the guys and gals at Saatchi have made a fabric cover for playground swings. It’s a cool idea, but like most guerrilla ideas, it will likely only get seen by a handful of people. What’s more, I can’t imagine these will stay on the swings for very long. They’ll slip off and get blown around the playground in no time flat. So it’s just as much litter as it is advertising, but hey, it’s a fun idea.